Lab Rats completing their final V-Sum of this 5-Week cycle. My Rock Climbing Lab Rats finished their 5-Week training cycle Thursday. I described the basic outline of this cycle in a post here a week ago, and today want to focus mostly on the results. I narrowed the Rock Climbing intensity in this cycle to focus primarily on strength. From the fitness perspective, the two rock-climb specific exercises I chose to focus on strength were campus board dynos and campus board dead hangs. 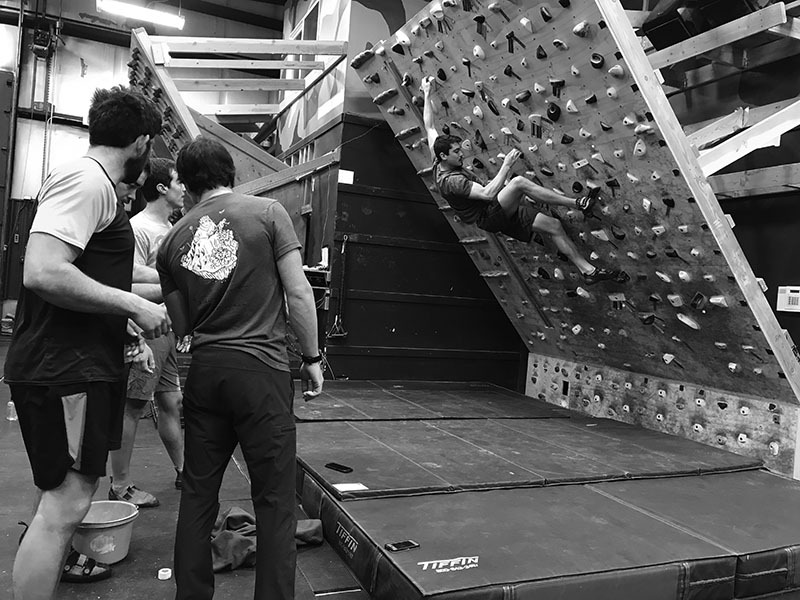 Also, our new Moon Board for the first time allowed me to deploy my favorite overall rock climb-specific training tool, the Bouldering V-Sum, in my facility training sessions. 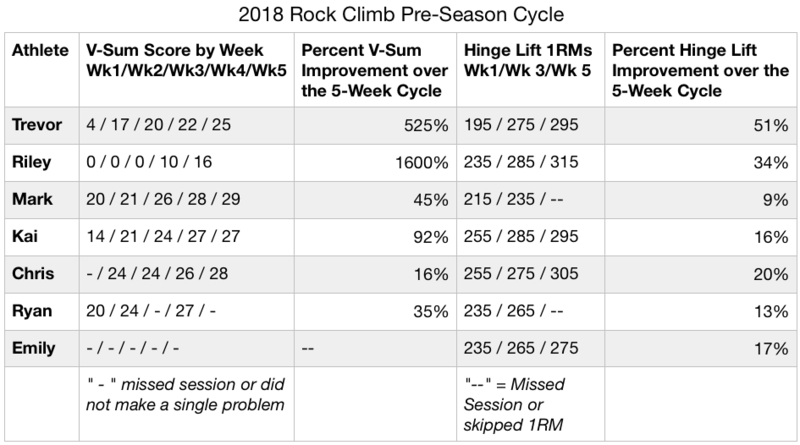 My climbers conducted a V-Sum every Monday throughout the cycle, and as their rock climb-specific finger and grip strength and fitness improved, I added in a second V-Sum on Wednesdays for weeks 4 and 5. Tuesday and Thursday were strength days, focusing on rock climb-specific campus board dynos and dead hangs, and for general strength, the Hinge Lift supersetted with an upper body pressing movement such as Scotty Bobs. My climbers completed a Hinge Lift 1 Repetition Maximum (1RM) three times during this cycle – weeks 1, 3 and 5. Weeks 1-2 I used our eccentric strength progression with for their Hinge Lift work. Each Eccentric Hinge Lift caused the athlete to concentrically hinge the barbell off the floor to a full standing position, then slowly lower it down to the floor on a 5 second count. After Week 3’s mid-cycle 1RM, I changed to our Density progression – where the athletes are put on a 90-second interval each round or set. 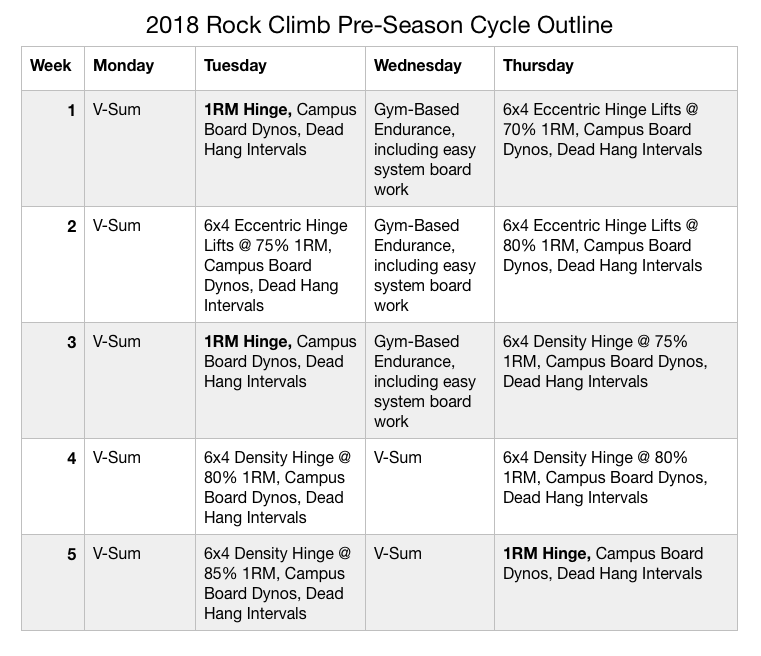 For the Campus Board dynos and dead hangs I used the same set/rep scheme throughout the cycle, and “progressed” the athletes individually by moving them to harder campus boards as they became more fit and improved. We have 3 campus boards – easy, moderate and hard. The difference is the size of the rungs. Our easy board has the widest rungs – which means it’s the easiest to grip. Rung size decreases approximately 1/4 inch down to the moderate board, and another 1/4 inch down to the hard board. Thursday’s Weeks 1-3 session was an “unload” for the climbers’ fingers. I would have them complete long, 30-40 minute gym-based endurance sessions, a component of which includes some easy system board time where they would move easily on the system boards. Six of the 7 athletes saw a substantial increase in their V-Sums over the course of the cycle. This isn’t all fitness-related as the V-Sum also tests and pushes technique, but outside the gym, this distinction is mute – all that matters is how well you climb. There are two levels of Moon Boards and we currently just have the upper level. It’s easiest problems begin at V4, and as you can see above, for the first 3 weeks, Riley couldn’t climb even one of these problems, and Emily was unable to complete a single problem over the course of the cycle. My more experienced climbers who were able to score a V-sum each week saw significant improvement. Hinge lift strength also improved for each athlete substantially over the course of the cycle. It’s safe to say, however with the exception of Emily, each of the athletes has a low training age for the hinge lift – so a good portion of this improvement cannot be related to strength increases, but simply becoming more familiar with the exercise. Regardless, the gains are there and were substantial. Mark tweaked his low back and so I pulled him from the Week 5 1RM Hinge attempt. Ryan missed the week 3 V-Sum and pulled a tendon in his palm during the Week 4 V-Sum – so I pulled him from the rest of the cycle. 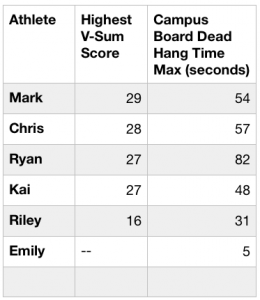 On the last day of the cycle, I was curious to see if there was a substantial correlation between a max effort for time dead hang on the hard campus board and highest V-Sum score over the course of the cycle. So the last training session, after a warm up, I had the athletes conduct a dead hang for time. The chart below shows both the athlete’s max V-Sum Score and their max effort dead hang time. I was hoping to see a correlation between a high dead hang time and a high V-Sum score, but as you can see in the chart below, four of the high V-Sum scores are within two points of each other, and with the exception of Ryan, the dead hang times are also fairly close. We’ll continue to test this general theory in the years ahead – specifically the link between rock climbing finger strength and overall climbing ability. As discussed in my previous article on this cycle, our dead hang interval scheme or this cycle was a complete bust … so I’ve got to develop another. We’ll do this the MTI-way, complete an assessment, then have 2-3 groups of athletes complete different dead hang intervals, then re-assess and see if there is a clear winner. Also – we’re having the easiest level of Moon Board added to our equipment and will have that option for athletes and testing the next go-around.